Gabions are essentially rocks in baskets! Wire or welded mesh baskets are commonly filled with sandstone, bluestone or river pebbles. 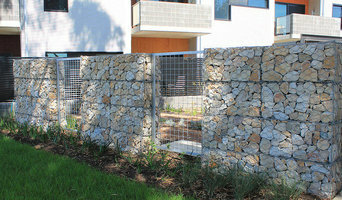 Prospect Contractors have been installing Gabions for over 20 years and have earned a reputation as leaders in the Gabion installation industry. Around the world Gabion retaining walls have been an effective, environmentally friendly solution where erosion has been a problem. Gabions are used widely for water and drainage management as well as for facilitating soil stabilisation. Gabions are also an effective noice insulating product and are widely used in areas of high traffic, acting as an effective sound barrier. Weld Mesh Gabions are also becoming a popular choice for fencing, feature walls and bench seating. At Distinctive Gardens we have a dedicated team who pride themselves on installing gardens of the highest quality of workmanship. We believe we can develop and create a landscape that is strikingly beautiful, functional and uniquely designed for you. Distinctive Gardens is lead by Robert Cooper with over ten years experience designing and constructing quality landscapes throughout Adelaide. From Concept to Maintenance, Mr B’s Landscaping and Garden Care offers a complete landscaping service, providing creative design, professional landscape construction and specialised garden maintenance to complement your individual style and requirements. Mr B’s has a professional team of qualified and experienced personnel who are enthusiastic about their work. Ron and Elaine manage every project personally to ensure that your requirements are met down to the finest detail. Landscape design and construction business with a focus on attention to detail and care for the aesthetics of the gardens we produce for our clients. Bright-On Landscaping has been established since 1987, we are fully licensed, insured and have enjoyed creating beautifully landscaped gardens in Adelaide for over 30 years. Odds are we have worked in your area and are familiar with the soil and conditions! We are pleased to say most of our work is "repeat work" or from referrals which is testament to our dedication. As a small business we have been able to maintain a high standard of quality landscaping, we employ our own Horticulturist staff that pay particular attention to detail – they are part of a trusted, dedicated and hard working team. Whether you have a small or large area to create, please browse through our photos, we hope that we can help you make your garden into a place of enjoyment and relaxation for years to come. 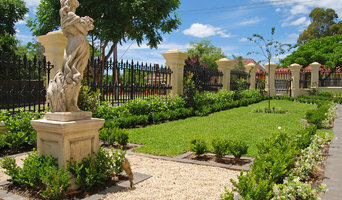 Uniq Spaces Adelaide, is stacked with fresh and innovative landscaped garden design and ideas. From design to completion, we will not only deliver a project that will exceed your expectations but will leave you boasting for a lifetime. We will work with you closely to take your ideas and mash them up with ours for a guaranteed crowd pleaser. We will educate you throughout the entire process, hand pick materials, stick to your budget and deliver results in a timely manner. Leigh and the professional team at Adelaide Retaining Walls are renowned for their quality workmanship and commitment to excellence. A Proudly South Australian Company and fully licensed builder (BLD225986) we offer fixed price quotations on all works, with a 10 year written guarantee on all retaining walls. Our friendly Industry Accredited staff, complete with modern vehicle and machinery fleet, specialize in all commercial, domestic, Insurance repair and difficult site access projects. You can be confident all constructions will receive the same courteous attention to detail, no matter how large or small. 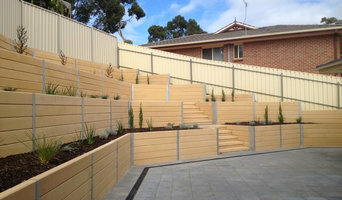 Adelaide Retaining Walls will never compromise our high standards, strictly adhering to all Engineering requirements and only ever sourcing the best quality materials. Adelaide Retaining Walls have comprehensive JSA’s (Job Safety Analysis) and job specific Work Method Statements, together with our QOH&S Policy and Procedures, are guaranteed to meet the most stringent site requirements. Finally, we LISTEN to our customer’s needs, then provide the best possible solutions, in the most cost effective and friendly manner. Our vision is to create the perfect outdoor surrounding for our clients based on individual needs and circumstances. Whether you are building a new home, renovating a classic, or re-designing your yard; we have the experience and expertise to create your ideal setting. Need landscaping? Timberwork? Or block and paving works? Freeman Landscaping is with you in every step of your outdoor journey. From quote to design, creation to handover, our sole purpose is ensuring that your vision becomes a reality. At Freeman Landscaping, we have a team of qualified landscapers, designers and carpenters who take pride in bringing to life the vision of your new or existing outdoor space. We have a broad range of experiences in commercial and residential landscaping which will allow us to work with you to create your ideal space. Gardener's Treasures is the largest online plants and gardens nursery in Adelaide and have owned and operated both retail and production nurseries. Browse our colorful and unique range of indoor and outdoor plants. We offer high-quality plants at affordable prices. Southern Scapes has been creating and maintaining Estate & residential gardens since 1995. Southern Sacpes has also operated overseas in the United States of America and the United Kingdom and Singapore. along with the Southern Highlands of nsw and the eastern suburbs of Sydney We are a boutique business which ensures our work is always consistent and of the highest standard. Our team is highly qualified, trustworthy, reliable, efficient and friendly. At Southern Scapes a thorough job is done every visit, with ongoing maintenance and development programs designed to ensure your garden is performing at its peak all year round. Working with clients on a one to one basis in order to achieve a beautiful garden that is attractive, reflecting you and your life style. We specialise in Garden design, renovation and maintenance. We take pride in our work and our client’s complete satisfaction. The Great Outdawes Landscaping is an Adelaide based business. Our outdoor ideas are perfect for courtyards, patios, front gardens and backyards in both domestic and commercial settings. So if your plans include swimming pool landscaping, garden edging, edible plants (vegetable & herbs), australian flora, moss rocks, retaining walls, fencing, water features, pergolas, decking, feature screens, outdoor kitchens, pizza ovens and unique ideas Phil is the person to contact. See your outdoor space come to life with detailed sketches and computer generated designs. All you need to decide is if you want something modern and contemporary, traditional, tropical, family / children friendly, environmentally responsible or something that is just beautiful & inspiring. We are happy to offer services from design, installation, maintenance, horticultural advice, scheduled monitoring, pruning, fertilising and more to get your garden looking perfect and to keep it that way! 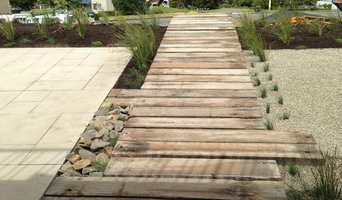 Choose The Great Outdawes Landscaping to add curb appeal to your property, you wont be disappointed. Our team of experienced tradesmen are committed to delivering quality workmanship and practical solutions in landscape design. We cater to both domestic and commercial requirements. By choosing LeVANT, you can rest assured that your upcoming project will not only be first class in function and integrity, but also conform to current Australian Standards. ¿Qué hace un jardinero en Adelaide, SA, AU? 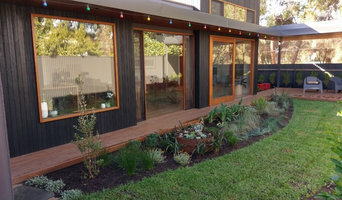 Con tal de cumplir con sus funciones, los jardineros en Adelaide, SA, AU utilizan diferentes herramientas de jardinería y maquinaria especializada como por ejemplo: cortacésped, tijeras de podar, rastrillos, azadas y raederas. Además de esto, hoy en día se pueden ver jardines verticales y cubiertas vegetales que hacen que las ciudades adquieran un tono más verde, más ecológico. La idea es ocultar el color gris de los edificios y del cemento que tan poco ayuda a levantar el ánimo de los más estresados. Siempre al día, los jardineros de Adelaide, SA, AU también podrán ayudarte con el mantenimiento de jardines que son tendencia. Encuentra jardineros en Adelaide, SA, AU. Mejora los resultados de la búsqueda en la sección “Profesionales” incluyendo el nombre de tu ciudad o comunidad autónoma. También puedes consultar las fotos de proyectos de los profesionales de Adelaide, SA, AU para encontrar expertos que hayan trabajado en proyectos similares al tuyo.